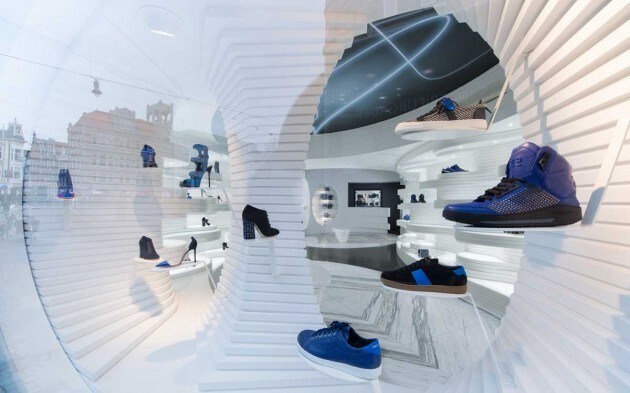 MVSA Architects have designed a flagship store for Shoebaloo in Amsterdam, The Netherlands. 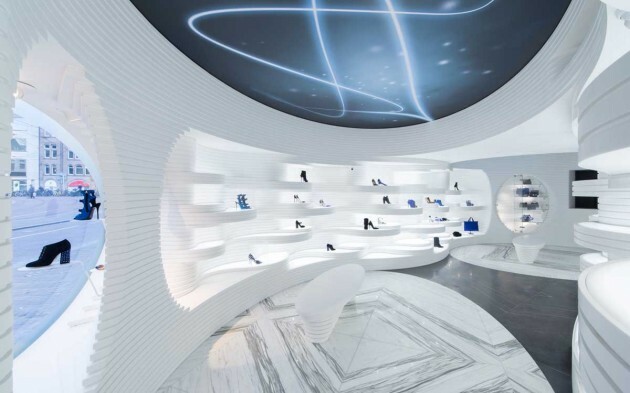 In the Shoebaloo tradition, the design of the Koningsplein flagship store features a unique retail concept that suits the high-end designer shoes and accessories on display. 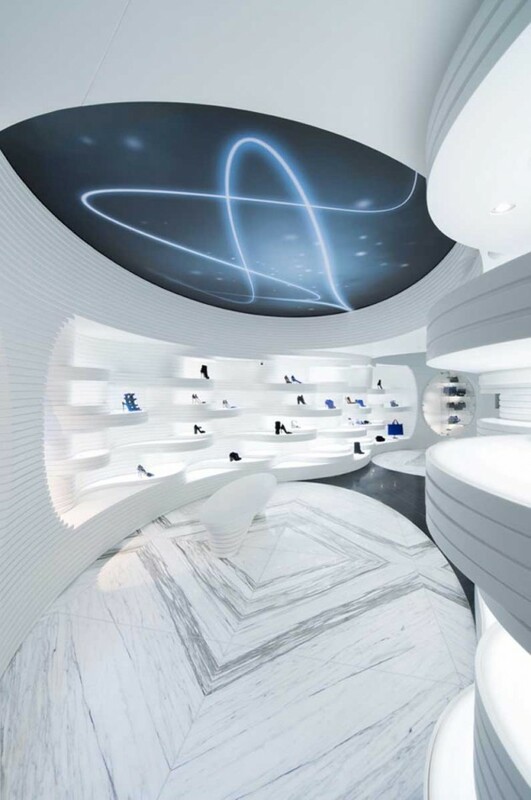 More than just a store, Shoebaloo offers a spatial experience where shoes emerge like precious treasures. The concept of many Shoebaloo stores presents a closed, mysterious display window that reveals little of what lies behind. At Shoebaloo 5 Koningsplein, in contrary, this world already appears open and transparent from the outside. The glass front has an elliptical bright white display window that gradually transforms into two openings that, from the street, view into the store. The display window glows invitingly. 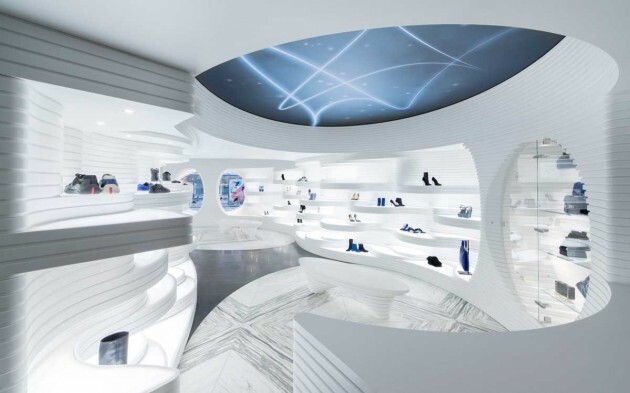 A dynamic play of lines emerges from the openings in the display window, where varying heights of curving translucent surfaces, with integrated lighting, display the shoes. 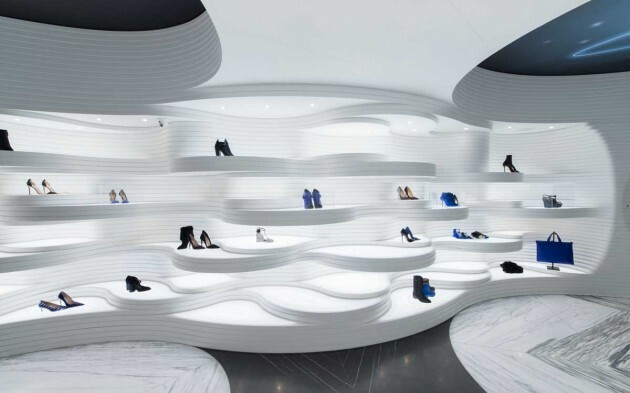 The store comprises two elliptical spaces that gravitate towards each other in the centre of the space. At the rear is the counter and a large vertical elliptic vitrine, both integrated into the contours. Behind the counter is a smaller display that houses accessories. The freestanding mirrors and seating elements were custom-designed for the interior. The sinuous walls are clad with layers of pure white Hi-Macs, a solid surface material. Continuing the play of lines in the walls, the displays are fashioned from thinner layers of translucent Hi-Macs underlit with LEDs. The floor is composed of book-matched marble slabs. Two ellipses of white marble feature black veins. The middle section where the elliptical spaces start to merge is articulated in reverse in black marble with white veins. The dark ellipse ceilings feature a pattern of fluid, bright, glowing lines that twist through a starry sky.